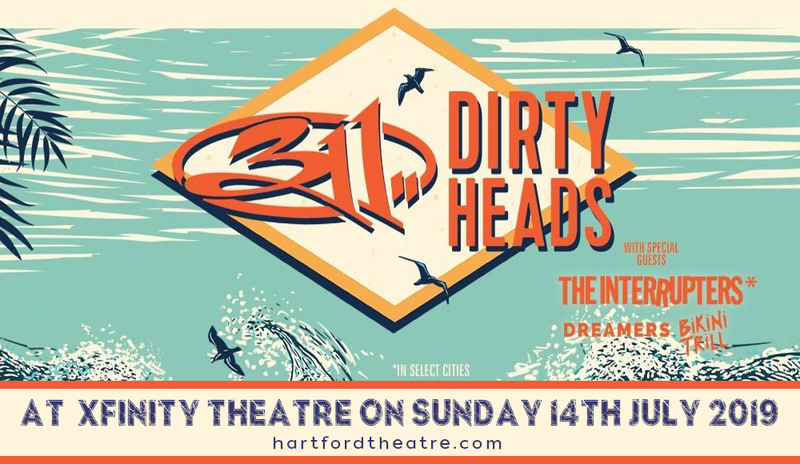 Great sounds, great times, good vibes… this is how reggae-rock bands 311 & The Dirty Heads celebrate their "The Sounds of Summer” tour. Indeed, more than a show, it's a celebration of the hot sunny summer season where everybody just wants to hang and party 'til they drop. And yes, they're swinging by on nearby shores as they bring in the summer breeze at the Xfinity Center on Thursday 14th July 2019. Don your summer OOTDs, kick your flip flops, let your hair down….but wait, have you booked your tickets yet?!? A huge wave of fans and party peeps are now causing a surge of demand for tickets. Get a grip of this hot ticket before it slips away. Click that 'buy ticket' button now. 311– pronounced “three-eleven”, was formed way back in 1998. The band has managed to achieve both commercial and critical success. They have a long-string of best-selling albums, propelled by radio hit charting singles that filled the airwaves non-stop. Some of their top-selling albums include: “Music” in 1992, “Grassroots” in 1993, and 1995’s eponymously-titled album, otherwise known as “The Blue Album”, thrust into the Billboard 200, by the singles “All Mixed Up” and “Down” eventually selling over three million copies in the U.S.
Make this a summer to remember. Book your tickets to "The Sounds of Summer” tour courtesy of 311 & The Dirty Heads.